Celebrate the Bartman comic book! Giclee has been printed on paper and is a limited edition of 150 hand-numbered pieces. Measures 22-inches tall x 17-inches wide and includes a certificate of authenticity! 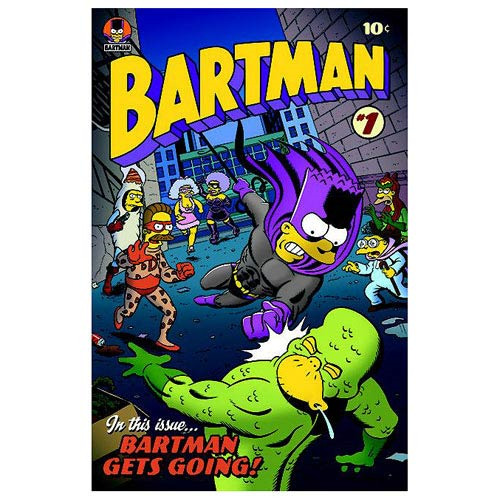 Commemorate the first ever comic book of Bartman! The Simpsons Bartman #1 Comic Book Cover Paper Giclee Print features an image of Bart Simpson dressed up in the costume of his alter ego, Bartman. Bartman is seen here in an alleyway, punching a villain in the jaw while being surround by even more villains played by popular characters in The Simpsons like Lenny, Flanders, Selma and Patty, and more, plus the words, "In this issue... Bartman gets going!" Measuring 22-inches tall x 17-inches wide and printed on paper, this awesome giclee art print is a limited edition of 150 hand-numbered pieces and comes complete with a certificate of authenticity. Ages 14 and up.